There are generally two types of degrees you can earn in graduate school: a master’s degree or a doctorate degree. At some colleges, you can earn a master’s degree in as little as one year. On the other hand, getting a doctorate degree can take from three years to seven years or longer. Since going to graduate school can consume years of your life, it’s essential to understand what benefits getting an advanced degree can provide. So, why should you go to graduate school? Since some jobs require you to have a master’s degree or other advanced degrees like an M.D. or J.D., graduate school can help you advance in your career. If you’ve been in the job market for a few years and you feel like your stuck in a rut and need to boost your resume, getting an advanced degree will show employers that you have the education or field-specific knowledge to fulfill their company’s needs. Along with the prospects of getting a better job, earning an advanced degree can also help you transition to a new career field. If your undergraduate degree is in English Literature and you’d like to become a city planner, it’d be beneficial for you to get a master’s degree in urban planning as a way to grow your knowledge in the field and demonstrate to employers that you’re ready to make a career switch. In most graduate programs, the professors who work in the department are experts in their fields and can provide you information otherwise not accessible to those outside of the college. Prestigious schools and universities also maintain cutting edge equipment as they conduct research and provide centers of learning that work to benefit the general public. Going to graduate school can get you access to the leading minds in your career field as well as grant you opportunities to use the latest equipment and tools during your time in school. Goodcall.com reports that according to “The Economic Value of College Majors,” a study conducted in 2015 by Georgetown University, college graduates with a master’s degree earn $17,000 more annually than those with only a bachelor’s degree. 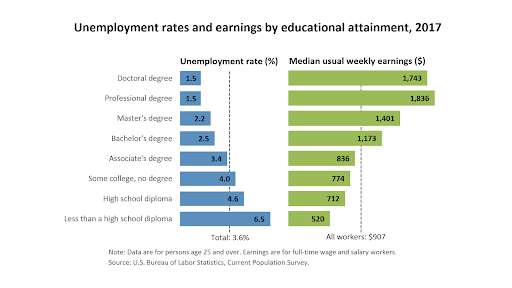 Over 40 years of working, a master’s degree holder would earn well over half a million dollars more than their bachelor degree holding counterpart. So, going to graduate school can be a way to increase your salary prospects and improve your standard of living. In graduate school, unlike the first years of undergrad, much of your time will be spent focused on a single topic in your program of study. So, if you’re interested in taking a few years away from working to learn more about a subject that interests you, graduate school is the ideal opportunity. Access to knowledgeable faculty and a wide array of university resources, including large libraries and state-sponsored research labs, present a rare chance to study and learn in an environment not available to the public at large. Graduate school can be expensive with the average tuition ranging anywhere from $10,000 per year to upwards of $30,000 per year. You also have to consider the income you lose while attending graduate school and not working as well as the unanticipated costs that come with professional networking and social events that are wholly voluntarily, but necessary if you want to get the most out of your graduate school experience. Consider if you have enough money saved, can work part-time, or have a parent/family member who can help you pay for tuition. There’s also tons of scholarships available to students enrolled in graduate school as well as opportunities to receive federal or state aid. To help pay the costs of school, some graduate students work as teaching assistants, research assistants, or procure grant funding from organizations or departments across campus.